Following the submission of the Local Plan for independent examination on 15th May 2017, Melvyn Middleton has been appointed as the government planning inspector who will conduct the independent examination into the the soundness of the Local Plan. And he has already started! I was deeply concerned to learn that the Planning Inspector has claimed that WHBC’s Local Plan “falls far short of meeting the identified housing need”. I am the first to criticise the Borough Council for many things that it does but the plan it has submitted is already way in excess of what the Borough’s residents feel the area can sustain. Central Government seems to have no awareness of the fact, or chooses to ignore, that we in Welwyn Hatfield have major traffic problems, inadequate medical provision, not enough schools and definitely not enough infrastructure to cope with the 12,000 homes that WHBC has put into the plan – let alone one or two thousand more. Is the Inspector totally oblivious of the fact that there is only one proper hospital, which constantly works to capacity? There are no provisions for another one. Where are all the people in these homes going to work and how are they going to commute? We have appalling links to London; the A1(M) is blocked with accidents on a daily basis; the M25 is one of the world’s slowest ring roads; the only bus to London (797) was stopped two years ago and other bus services have been drastically reduced. As for the trains: mostly unreliable and pretty appalling and Govia’s plans for the future do not make encouraging reading. Parking anywhere is more and more difficult – especially at train stations, not to mention the exorbitant cost. So what does the Inspectorate want to achieve? Cram more and more homes into the area regardless of the fact that the facilities are just not there to support them? The “elephant in the room” that no-one mentions is Brexit! How can anyone accurately “assess” future housing requirements when no-one knows how Brexit will affect this? The OANs (objectively assessed needs) were calculated before the Brexit vote! There will certainly be a slow-down in residents coming from Europe, and many currently here may decide to return home or relocate due to changes in workplace. Central Government should take stock of the situation and see how it develops. It should build new towns with good transport links to major cities and stop forcing local councils to ruin beautiful areas by cramming housing into every nook and cranny regardless of consequences. This is the third and final article on the Draft Local Plan; previous articles have presented The Facts, and The Fall Out. 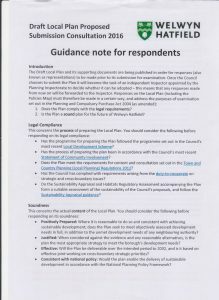 As with the earlier articles, the following comments are the result of the work of the Welwyn Planning sub-group, formed by the Welwyn Parish Council for the express purpose of analysing the Draft Local Plan, and including elected representatives of the Welwyn Parish Council Planning Committee. the Welwyn Parish Plan Action Group, and the Welwyn Planning & Amenity Group. It is self evident that Housing Developments should not be undertaken without regard to the impact on the local infrastructure, of schools, traffic and health, but it is commonly felt in the community that this is exactly what planners and developers do. There is a concern that whereas the needs of an upcoming development might be assessed, there is also a need to take into account the impact of very recently completed, or part completed developments. In regard to Schools, provision has to be made by law for childrens’ education and, unlike increases in traffic, cannot be ignored. For this reason when discussing the need for primary school provision in the Civic Parish of Welwyn, the Planning sub-group has taken into account the recently completed 100 houses on the Frythe development (Wilshere Park) in order to judge or make an assessment of needs. Other infrastructural issues relate to funding, and specifically the application of section 106 Agreements and CIL (Community Infrastructure Levy) which Welwyn Hatfield has yet to introduce. The pond is cloudy at the very time when clarity is needed. When the Borough introduces CIL there will be statutory rules regarding restrictions on the number of financial contributions obtained through planning obligations which can be ‘pooled’ to fund particular infrastructure. The effect of this is that planning obligations under section 106 will remain in use alongside a CIL charge, but for a more restricted set of purposes. For this reason, the Infrastructure Plan should explain the consequences, advantages or disadvantages of waiting until late 2017 or 2018 before the CIL is introduced. The infrastructure comments below are based upon the following estimates of housing numbers in and around Welwyn Parish obtained from the relevant plans. From what we know from Local Plans we can expect 450 of the houses recently completed or planned for this part of Welwyn Hatfield to be occupied in the first 5 years of the Plan and approximately half of those planned for Codicote in the same period. The demand within the parish will be for primary school places and this demand, according to HCC calculations, equates to IFE, ie 30 children, which agrees with the WHBC estimate (Para 6.59) and capacity throughout the primary school years ultimately of 210.. The primaries at Woolmer Green and Oaklands have neither the capacity nor the space to expand. We understand, (although no details have been provided) that the same applies to St John’s Digswell. St Mary’s could expand to be a 3FE school and, given its Outstanding rating from Ofsted this would be attractive to residents. It is appreciated that this would require the loss of contiguous playing fields but this is permissible (Paras 6.24/25). There is a statement that St Mary’s is a listed building. This is not correct. The alternative, a new school, which would have to be a Free School/academy, would require land of its own on which to be established. Codicote is in the Borough of North Hertfordshire but its 1FE primary (recently reduced from 2FE?) is short of places. Development in Codicote will put further pressure on the local school and some consequent spill over to Welwyn Parish (Para 6.59). unless that school is expanded. Some influx from Knebworth might also be expected (Para 6.59). Para 5.104: There is a traffic mitigation plan for the 4 roundabout complex associated with the A1(M) junction 6. In addition to southbound traffic from the motorway itself the feeder roads from the north, B197 from Knebworth and Woolmer Green and B656 from Hitchin and Codicote will, by 2022 be carrying significantly more traffic into Welwyn Hatfield via Welwyn. With the intended timescale of development (see above) the traffic mitigation scheme is scheduled for the period 2023-2027. The Traffic Mitigation Plan is a small scheme, costing approximately £0.5M. and the Borough should urge the Highways Agency to bring this small scheme forward by several years to minimise the traffic problems that these developments will make, rather than attempting unsatisfactory patch-up solutions later. The Bridge Cottage Practice in Welwyn has a patient list of just over 16000. Its catchment area extends beyond Codicote to Kimpton, where there is a satellite surgery by appointment only. The algorithm used to calculate GP needs (para 7.30) suggests that 8.5 full time GPs will be needed to service the expanded list (17000). It is not clear to us what the current staffing level is but this figure should be the target. We will hope to be able to fill in the gaps as we move forwards. This is the second of three WPAG articles which present a summary of the analysis undertaken by a Welwyn Planning sub-group, whose membership included the WPAG. The first dealt with ‘The Facts‘, and this one deals with ‘the Fall Out‘. A third article will cover our analysis of the Borough’s Infrastructure Plan, when we have reached our conclusions. The Welwyn Planning & Amenity Group has contributed to a joint response submitted to the Council today, 21st October 2016, and we acknowledge the quality of research and analysis from within that Group, and particularly the contribution of Ian Skidmore, of the Parish Plan Action Group. the need to focus on the legality (of compliance) and soundness of the Council’s approach. This WPAG article now deals with the Impact of the Local Plan on the Civic Parish of Welwyn. It will separately address the settlements of Oaklands/Mardley Heath, Welwyn, and Digswell. complied with the Sustainability Appraisal. is compliant with the National Planning Policy Framework (NPPF). So – what is there to shout about for Welwyn? As a member of the Planning sub-group, we have examined, and re-examined, all the development sites proposed for Welwyn, including those now being put forward for approval, and also all those which have been rejected by the Council. We have examined each site in turn, and to each we have applied our test for legality and soundness so that we can be confident in our conclusions. For a detailed description of these sites, go to the Borough Council Consultation Portal. Sites for Housing Development (The Infrastructure Delivery Plan will be addressed separately). An appraisal of strategic advantages or disadvantages. We consider the draft Local Plan to be legally compliant. Several sites have been proposed for development, of which some have been rejected and others are in the Local Plan. We believe the process employed in making these decisions was sound, with the single exception of GTLAA04.HS32 which is discussed below. OMH7 Land at 22 The Avenue, passed Phase 2 of the HLAA but was subsequently rejected because of difficulties establishing a defendable Green Belt Boundary once the current boundary, the A1(M) was breached. (Housing Site Selection Background Paper 13.10 and Appx.D June 2016. This is consistent with the NPPF. OMH5, HS 17: (2a to 12 Great North Road), OMH8 HS 16: (2 Great North Road) were both reviewed positively during the various phases of the HELAA (HELAA 2016) and are proposed to be taken forward. GTLAA04. HS32.The Four Oaks Gypsy/Traveller site has currently 5 permitted pitches and is in the Green Belt. The Plan allows for 6 further pitches, a total of 11, and exclusion from the green belt.. We do not consider this to be sound. This site is a private not a public site and so cannot contribute to the identified need for public sites in the borough and, from this standpoint, fails to be either positively prepared or justified. The planning history of the site is complex but in summary a six-Authority review in 2007 concluded that this site was not suitable to accommodate further pitches. Following this the borough has until now consistently maintained that the site is only suitable for 5 pitches, i.e. 10 caravans and their associated support buildings. Changing the Green Belt boundaries to exclude this site is feasible and the new boundary would be defendable but this does not in any way alter the capacity of the site. The Inspector should also be aware that, in parallel with this plan there is a planning application (N6/2016/0211/S73B), currently on hold, that seeks permission for up to 20 caravans of which no more than 5 should be static or mobile homes. Welwyn is the historic centre of Welwyn Civic Parish It is excluded from the Green Belt. Several sites have been proposed for development, some have been rejected and three have been included in the Local Plan. It is our view that the processes involved in making these decisions were sound. See below. Sites Rejected by the Borough Council. Site Wel5, the “school reserve site” was rejected at HELAA Phase 1 as it was impossible to achieve access. HELAA 2016, appendix D). Sites Wel6,(Kimpton Road Gravel Pit) Wel8 (Land at Rollswood Road) Wel10 (Whitehill),Wel12 (Northof Reynards Road),Wel13 Field opposite 40 Reynards Road) were all rejected at HELAA Phase 1 as they were not in or contiguous with an established settlement (HELAA 2016, appendix D) and thus were contrary to NPPF (para 80). Wel14. Because of access issues this site would only be viable in conjunction with Wel 1 and Wel 2 and the reasons for rejecting it mirror those for the other two sites (HELAA 2016, Appendix G). Wel16 (Whitehill). Access to this site is via a village road that is mainly single width with poor pedestrian provision and with a pinch point that cannot be modified. (see Highways comment in HELAA 2016, appendix G). Emergency access via single track roads would be problematic. The connection with the existing settlement is tenuous. Wel4 HS 19. (Sandyhurst) This partially developed site would extend the green belt boundary to the A1(M) junction 6 exit slip road which is a good permanent boundary. The borough resisted extending the site further to the southwest to maintain a significant and defendable gap between Welwyn and Welwyn Garden City. (HELAA2016, appendix E). Excellent public transport connectivity. Wel11 HS18. (The Vineyards) This site, part previously developed land, would have moderate to strong green belt boundaries. There would be some loss of openness. Good access to public transport. (HELAA2016, appendix E). Traffic sitelines will need to be managed. We consider the draft Local Plan to be legally compliant and to be sound. Dig 1, (Hillside land behind 2 New Road), was rejected in the Phase 1 HELAA (HELAA2016 appendix D) with concerns over visual openness and drainage and water run-off leading to flooding. This is in accordance with NPPF. Dig 2 (Adjacent to 81 Hertford Road) and Dig 3 (Land North of Harmer Green Lane)were rejected at HELAA Phase 1 as they are not contiguous with a settlement excluded from the Green Belt and so were contrary to NPPF on green belt development. Dig4 was rejected at Phase 2 for similar reasons (HELAA 2016, appendix C). Dig 5, (land adjacent to 76 Hertford Road) was rejected at HELAA Phase 1 as it is not contiguous with the settlement and the majority is within a registered historic park and garden (HELAA 2016, appendix D). Part of the site is in a flood zone 3a. What is the Draft Local Plan Proposed Submission? The Local Plan and its supporting documents were published on 30th August 2016 in order for responses (‘representations’) to be made prior to its submission to an independent Inspector for examination in the Spring of 2017. Does the Plan comply with the legal requirements? 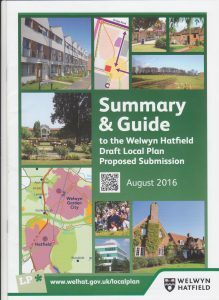 Is the Plan a sound plan for the future of Welwyn Hatfield? Has the programme followed the Local Development Scheme? Has it been in accordance with the Council’s Statement of Community Involvement? Does it meet the requirements for content and consultation set out in the Town & Country Planning (Local Planning) Regulations? Has the Council complied with requirements arising from the duty to cooperate on strategic and cross-boundary issues? Do the Sustainability Appraisal and Habitats Regulatory Assessment form a suitable assessment of sustainability, and follow the Sustainability Appraisal Guidance? This concerns the actual content of the Local Plan. Has it been Positively prepared? Is it consistent with National policy? 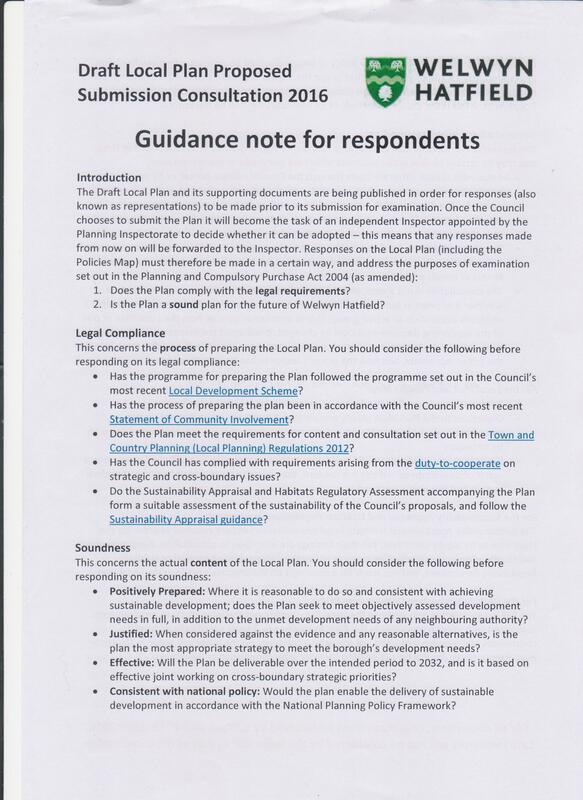 There is a lot of material guidance within the Guidance Note for Respondents, and it is recommended that you read this before responding on the soundness of the Local Plan. We are reminded that the consultation is not a ‘vote’, and the Inspector will give the same weight to an issue whether it appears in hundreds of responses or only in one. Residents Associations, and representative groups are encouraged to make a single response, which should nevertheless indicate how many the group represents, and how the response has been authorised. All responses must be received by 5 p.m. on 24th October 2016. So – What does the Draft Local Plan Proposed for Submission contain? The Local Plan sets out a blue print for future growth of Welwyn Hatfield, and contains a planning strategy for the borough, identifying sites where development will happen over the next 15 years, and policies to guide decisions on plannng applications. Public Consultation started on Tuesday 30th August and closes at 5 p.m. on Monday 24th October. A good place to start to get a grasp of the scope of the Local Plan is to study the Summary & Guide . Go online and get your own online copy. In the Summary & Guide you will learn that the Housing Target to meet the demands of the borough’s future generations is 12,000 new homes, and that the Council asserts that 6,500 homes can be delivered without developing on Green Belt land. But because 79% of our Borough is Green Belt Land, the amount of this which is required for new development in the Local Plan is less than 4%. The Local Plan will provide space to create 16,900 new jobs in the plan period, helping build a strong local economy. delivery of a sustainable pattern of developments by directing most new development to the towns and limited development to the villages. to maintain and enhance the vitality and viability of our town, neighbourhood and village centres. Welwyn Hatfield needs more housing and jobs to enable the next generation to afford their own homes, access varied employment opportunities and enjoy healthy vibrant communities. The population is growing, migration levels have been high in recent years, more people live on their own, and are living longer, creating a high demand for property. Policy SP2 sets Targets for Growth, and how best to distribute growth around the borough. The towns and villages are tightly constrained by the green belt and there is insufficient capacity in the towns and villages to meet the future demand for growth. To meet the need for 6,200 new dwellings, the Council considers that exceptional circumstances justify removing land from the green belt in sustainable locations around the edges of the borough’s towns and some villages. Land is also proposed to be removed from the green belt at Symondshyde north-west of Hatfield to create a new village. Policy SP3 deals with Settlement Strategy and Green Belt Boundaries, and proposes that Welwyn Garden City and Hatfield are the primary focus for development, and that the excluded villages are a secondary focus, compatible with a more limited range of job opportunities, shops, services and other facilities available within them. Sustainability Appraisal – you can comment on the assessment. Habitats Regulations Assessment – you can comment on the assessment. Draft Infrastructure Delivery Plan – which identifies infrastructure requirements which arise to meet the identified need for housing and employment and retail, including community facilities, education, roads and sewerage. You can comment on the contents of the Draft Infrastructure Delivery Plan. The best way to comment on the draft Local Plan Proposed Submission is online, but there are Forms which can be completed and returned by post. It is important to know that before you can enter an online comment, you must first ‘Register’, because it is a two-stage process – so do not leave your comment to the last minute as you might get caught out. The Welwyn Hatfield Borough Council are holding a series of six Consultation Events across the Borough, where you will be able to speak directly to Council Planning Officers, on a one-to-one basis, and obtain paper copies of the documentation. Details of all Events are included in the Local Plan Newsletter No.11 but for your convenience, the Consultation Event closest to Welwyn will be held on Wednesday 14th September 2016 at the Welwyn Civic Centre, Prospect Place, from 3.30 p.m. to 7.30 p.m.
You are all encouraged to go along, and ask questions. The WPAG and the Welwyn Parish Council Planning & Licensing Committee are actively putting responses together, so please let us have your views.